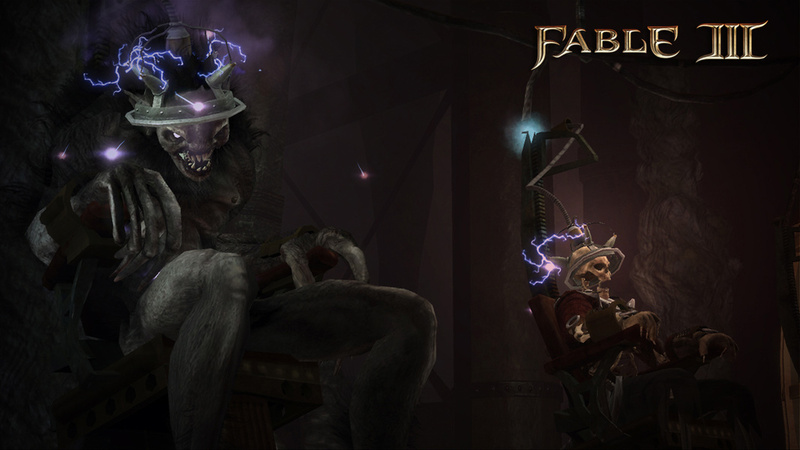 Lionhead Studios, as if apologizing for the embarrassment that was their "Understone" DLC, released another downloadable quest as an add-on to Fable III (see my review of the full game here). An apology is worth nothing, however, unless there is heart in it. With that in mind, "Traitor’s Keep" DLC is a panting fireman who’s just saved a family from their burning home and runs back in for their beloved cat, Claws. Unlike "Understone," which provided only one very small location (albeit inventively placed) with an all too linear objective and short, humorless narrative, "Traitor’s Keep" spans three brand new and expansive areas (islands) – Ravenscar Keep, Clockwork Island, and The Godwin Estate – that collectively play host to 4 new missions and several side quests capable of quenching any post-crowned adventurer’s wander-lust. Lionhead claims that the main story, which concerns events and people at a secret prison that keeps Albion’s most notorious criminals, takes no less than 2.5 hours to complete. As wandering about is half the fun of Fable, I think my gameplay clocked in somewhere around 5 or 6 hours for obtaining all 250 Gamerscore worth of new achievements. "Traitor’s Keep" is all about back-story. By way of an assassination attempt, the monarch comes to learn of Ravenscar Keep (the aforementioned prison) and that it has long been used by at least the two previous rulers: the current hero's brother, Logan, and mother. Given Logan’s predisposition towards military might and his hard-line tactics towards the general populous, one can imagine what types of people he incarcerated there ... namely revolutionaries, like the present monarch (though less successful), who’ve been seething ever since their imprisonment. While touring Ravenscar, players learn of a plot betwixt three pathologically fixated inmates, each of which (gasp) constitutes a quest, and one of whom fills in some blanks about how Albion transitioned to its industrial state. While "Understone" presented little challenge to players who had already leveled-up their character by way of completing the game, "Traitor’s Keep" introduces new enemies as well as a few variants on some favorite beasties that manage to evoke some mildly impressive battles (some of which are more inventive than tough and vice-versa). In addition to the new clockwork creatures (beetles, exploding dogs, and psychotic automatons), there are rainbow-licious hobbes, extra-hollow hollow men, and (my favorite) drunken balverines. 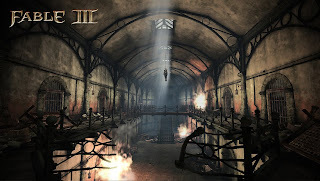 There are humans to fight as well, and being in a prison seems to have honed their group-based fighting skills a bit. If there’s a weakness to "Traitor’s Keep," it’s the obvious moral choices. Kudos are deserved for including them at all, but the few choices that are presented are so heavily weighted that there is absolutely no ambiguity concerning where the hero’s yea or nay would place him or her in an opinion poll...a shame given Hobson’s prominence throughout the earlier portion of the DLC. More decisions affecting the public-at-large would have been terrific, especially if they came to learn of the prison despite attempts at secrecy. That could have at least added a feeling of political pressure. Most importantly, "Traitor’s Keep" brings the funny. Sight gags and great writing as well as Fable in-jokes found scrawled across myriad notes and letters abound throughout this DLC. Supplement all of the above with four new outfits (three collected and one given) and one robot dog (non-exploding) to call your very own, and the 560 MS points it takes to purchase this quest seems a pittance for the experience. This review is based on downlodable content purchased by the reviewer.